Tyhan Brown, 18, appeared in Camden County Superior Court, Monday, Jan. 9, 2017. He is charged with first-degree murder in the shooting of 8-year-old Gabby Hill-Carter. Tyhan Brown, charged with shooting a little girl to death while trying to stalk and kill another man in September, has a plea deal on the table. Brown could be out of jail at the age of 58 if he accepts the offer of 40 years in jail. Charged with first-degree murder, he is back in court Feb. 13. Camden County Assistant Prosecutor Christine Shah disclosed the plea offer Monday during a brief procedural court hearing. Brown, 18, allegedly fired the bullet that struck Gabby Hill-Carter, 8, in the head as she played in front of her Camden home. 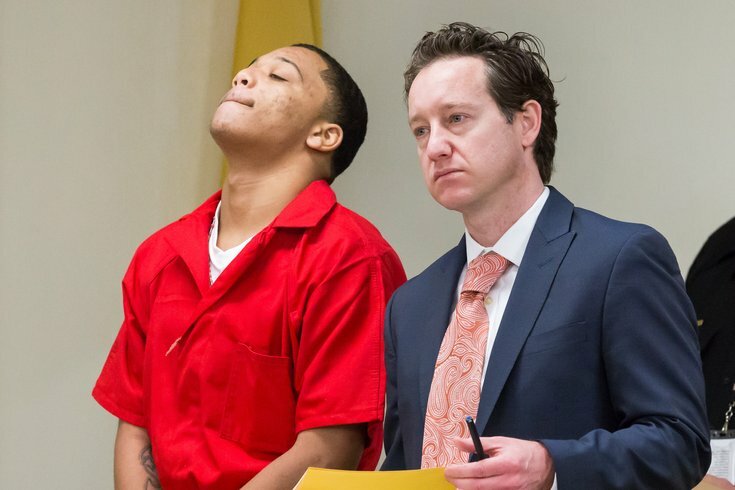 In custody since September, he appeared briefly in court on Monday, The Camden resident stared silently at the ceiling as he stood beside his lawyer. Land and Brown’s girlfriend, Natasha Gerald, 19, of Manor Court in Sicklerville, were in court on charges of misleading authorities about where Brown had fled after the shooting of the little girl. Shah, who leads the homicide unit of the Camden County Prosecutor’s Office, told Camden County Superior Court Judge John T. Kelley that the women have been offered plea deals of probation for their alleged roles. Brown is also charged with attempted murder for shooting at Amir Dixon, who was the apparent intended target of the gunfire that killed Hill-Carter. The shooting was sparked by a drug dispute, authorities said. Brown was arrested by the United States Marshals Service Fugitive Task Force at an uncle's home in Clarksville, Tennessee in September after fleeing South Jersey. He remains in custody, unable to post $1.5 million bail. Police Chief J. Scott Thomson said the Camden County Police Department is still intent of tracking down others believed to have been involved in the shooting. "We are still working diligently with the Prosecutor's Office and the FBI as this investigation will not be closed until every person who played a role that night in Gabby's shooting death is held brought to justice," said the chief.